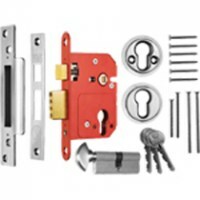 Locks that are operated by a key and a handle are know as Sash Locks, these have a locking dead bolt that is operated by a key and a latch bolt that is operated by a pair of handles. The sash-locks available from locktrader range from basic 2 and 3 lever locks right up to high security British Standard Locks for front doors. Euro and oval locks are also available for inclusion into a master key or keyed alike suite.